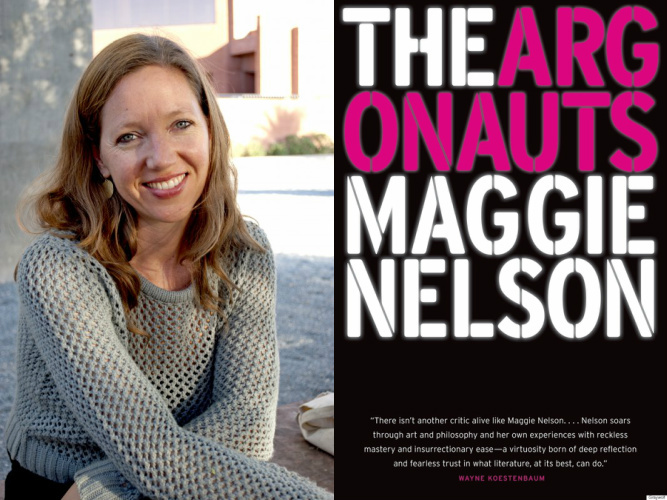 Maggie Nelson’s The Argonauts comes at a time when mainstream queer culture is all about resisting definitions. Refusing to apply clear and concise labels to oneself can be both a radical act and a way to walk the middle ground without having to declare open support for any community except for the self. At its core, The Argonauts is about walking that middle line and combining dichotomies to achieve a creamy middle. In it, Nelson explores gender, sexuality, and motherhood in a fluid, stream of consciousness style that transitions from one subject to another, curling back on itself occasionally to show the interconnectedness of these issues. At the heart of the book is Nelson’s relationship with Harry Dodge, an artist. Near the beginning, she says, “Before we met, I had spent a lifetime devoted to Wittgenstein’s idea that the inexpressible is contained—inexpressibly!—in the expressed.” Nelson implies that the reason she writes is to express the inexpressible through words, even though they can never quite do the job. On the other hand, when she describes the passionate arguments she had with Dodge on the subject, she says, “Once we name something, you said, we can never see it the same way again. All that is unnamable falls away, gets lost, is murdered.” This reflects the combining of public and private spheres mentioned throughout the narrative. As a memoirist, Nelson has a desire to express the inexpressible parts of private life, from the act of fishing inedible foods out of her son’s mouth to, at the climax, how it felt to give birth. As the book goes on, she does a similar thing with Dodge, revealing more and more of him beyond his gender identity until Dodge himself writes his own story of seeing his mother when she was dying of cancer, intertwined with Nelson’s recount of the birth. The public and private becoming one is no strange thing to people in the queer community. Some of the most private things, one’s sense of gendered self and one’s romantic and sexual affections, become wildly, terribly public, often with steep consequences. As Nelson notes, once a person is seen as “queer,” that signifier is all some people think about when considering them and their work. This goes both for the straight, cisgendered population as well as the queer community. When a queer person reads a book by another queer person, the tendency is to look for the hidden clues and try to identify with all of them, essentially making the work again about the author’s identity. Nelson recognizes this, and sets forth to craft a story that both validates her and her partner’s queer identities while making them a facet of their whole. She talks about the association of pregnancy with heteronormativity and poses the question: when does queer stop being radical and just become a part of a person’s identity? Can an issue that’s been so public for so long finally move to a wholly private sphere? Should it be wholly private? Throughout the book Nelson grapples with these questions, detailing small anecdotes of her life, intertwining them and presenting them as the expressions of the inexpressible. Maggie Nelson is the author of Bluets (Wave Books, 2009), Women, the New York School, and Other True Abstractions (University of Iowa Press, 2007), The Red Parts: A Memoir (Free Press, 2007), The Art of Cruelty (WW Norton, 2011), and The Argonauts (Graywolf, 2015). Nelson is also the author of several books of poetry, including Something Bright, Then Holes (Soft Skull Press, 2007), Jane: A Murder (Soft Skull, 2005), The Latest Winter (Hanging Loose Press, 2003) and Shiner (Hanging Loose, 2001). Nelson currently lives in Los Angeles where she teaches on the BFA and MFA faculty of the School of Critical Studies at California Institute of the Arts.